Unique Baby Shower Gifts For Boys: Mothership! Unique baby shower gifts for boys don't come more special or one-of-a-kind than our Captured Wish Mothership for Boys. Especially designed to celebrate the imminent arrival of a baby boy, the Wish Vessel comes in perfect custom packaging, is embellished with charms and with a verse card and color key explaining what the colors mean. the birth of a baby, a new baby boy. The bottle (40mm height including cork x 22 mm wide) is the shape of an old-fashioned milk can, and is adorned with charms that complement thoughts of motherhood. 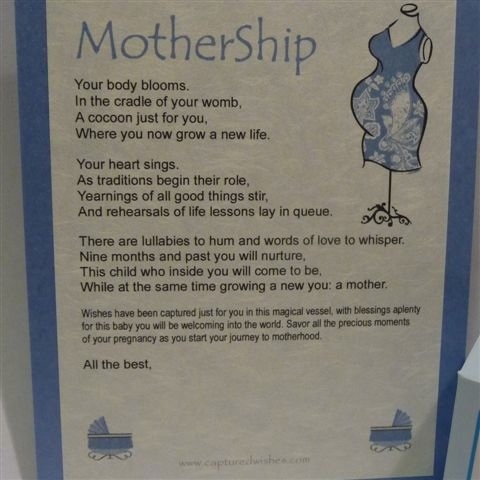 The card verse aptly describes all the hopes and the little star that can be opened by the mom-to-be is filled with these wishes (mix of silver and blue).